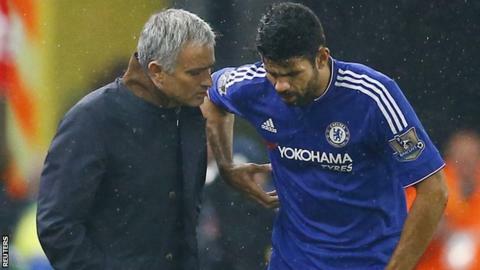 Costa, who ended a six-game run without scoring against Norwich on Saturday, completed 90 minutes in Israel. "I was disappointed. I reacted and he reacted too," said the Portuguese. "At half-time in the dressing room there were a few kisses and a few cuddles." Chelsea's win moved them level on 10 points with Porto at the top of Group G.
The two meet in their final group game on 9 December, when a point for Mourinho's side will be enough to see them progress to the last 16. "In the first half I could feel only the bad pitch stopped us from playing even better when we reached the last third," he said. "I think we played better matches than today, but we lost." Meanwhile, Mourinho confirmed John Terry is a doubt for Sunday's Premier League game at Tottenham after the defender injured his ankle in Tuesday's game.